Tara's Dream Cleansing Balm is a mild and effective botanical cleansing balm that transforms to a light milky lotion on addition of water. It gently removes make-up and grime without irritating or drying out the skin. 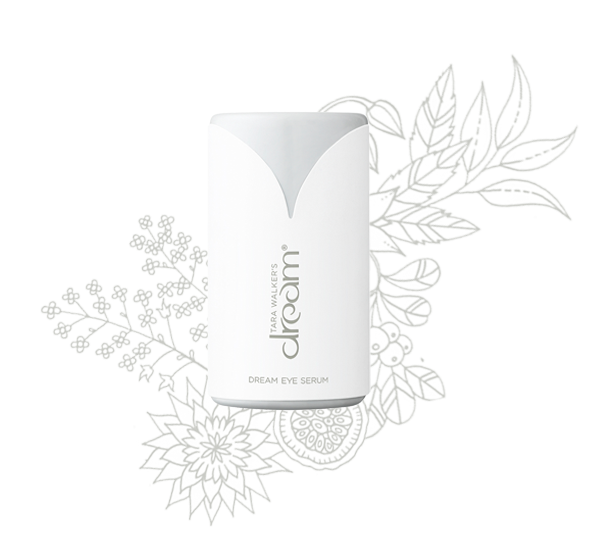 Enriched with Rejuvenating Dream Serum® 100+ Concentrate, this soft gel leaves skin fresh, clean, supple and perfectly prepared for the application of additonal products. Sugar and Vegetal Acids: Natural emulsifiers derived from sugar and vegetal fatty acids melt away dead cells, dirt and makeup. Olive Oil: An olive oil-based cleansing agent rinses away easily. The cornerstone of Tara Walker's Dream, this powerful aromatic serum contains 109 naturally derived active botanicals from around the world. This blend of extremely rare absolutes and essential oils protects the skin from free radical damage while nourishing and moisturizing the skin. A complete anti-aging treatment, the serum features refreshing extracts that revive dull, tired cells to make skin look brighter, more radiant and noticeably younger, along with rich oils to smooth the skin, improve elasticity and help diminish fine lines and wrinkles. This revitalizing cream is packed with natural ingredients selected to brighten and illuminate dull skin. Antioxidant and anti-inflammatory ingredients protect, soothe and calm the skin as powerful botanicals even out skin tone without irritating side effects. Sea Mayweed: This antioxidant-rich revitalizing seaside plant restores the appearance of younger- looking skin while reducing sensitivity and redness. Maca Root: Sourced from the Peruvian Andes and used for 5,000 years, this extract helps reduce wrinkles, improve radiance and make skin look younger and healthier. Bearberry, Grapefruit, Licorice, Mulberry and Scutellaria: This blend calms the skin, evens out tone and helps fade unwanted pigment. As you sleep, this indulgent treatment moisturizes, rejuvenates, repairs free radical damage, helps strengthen skin barrier function and works to restore younger- looking skin. The blend of biodynamic botanical and marine ingredients replenishes the skin's natural oils and leaves you with supple skin come morning. Green Microalgae: This targeted ingredient helps minimize the appearance of blood vessels. Beta Glucan and Chitin: In addition to providing skin with an intense moisture surge, these natural ingredients help maintain skin strength and elasticity. With organic orange flower essential water that soothes and calms the skin instead of the regular water found in most skincare products, this luxurious day cream creates a long-lasting film on the skin to lock in moisture and protect skin from environmental assault all day. Golden Seaweed: Protects the skin against inflammation and cell damage caused by UV rays while minimizing the appearance of wrinkles. Alaria Esculenta (Brown Algae): Rich in anti-aging omega-3, -6 and -9 fatty acids, this marine extract reinforces the skin's barrier while protecting skin cells. Roobios and White Teas: These extracts contain high concentrations of skin-protecting antioxidants. Designed to leave the eye area looking refreshed and lift tired skin, this one-of-a-kind eye treatment uses 100% organic living lemon water rich in trace elements and mineral salts in place of the regular water found in most eye creams. Among the results: Improvement in dark circles, puffiness and wrinkles and less signs of stress and fatigue. Golden Root and Yeast Extracts: These ingredients work together to help reduce puffiness by flushing excess fluid from the eye area and strengthen the skin. African Spilanthes Acmella Flower: Helps improve firmness and smoothes the skin surface to minimize the appearance of crow's feet.